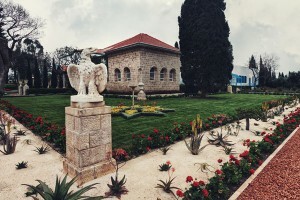 A view of the Shrine of Bahá’u’lláh near Acre, Israel. Born in 1817, Bahá’u’lláh was a member of one of the great patrician families of Persia. The family could trace its lineage to the ruling dynasties of Persia’s imperial past, and was endowed with wealth and vast estates. Turning His back on the position at court which these advantages offered Him, Bahá’u’lláh became known for His generosity and kindliness which made Him deeply loved among His countrymen. This privileged position did not long survive Bahá’u’lláh’s announcement of support for the message of the Báb . Engulfed in the waves of violence unleashed upon the Bábis after the Báb’s execution Bahá’u’lláh suffered not only the loss of all His worldly endowments but was subjected to imprisonment, torture, and a series of banishments. The first was to Baghdad where, in 1863, He announced Himself as the One promised by the Báb. From Baghdad, Bahá’u’lláh was sent to Constantinople, to Adrianople, and finally to Acre, in the Holy Land, where He arrived as a prisoner in 1868. 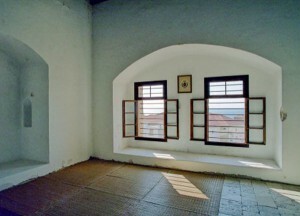 Bahá’u’lláh’s prison cell, Acre, Israel. From Adrianople and later from Acre, Bahá’u’lláh addressed a series of letters to the rulers of His day that are among the most remarkable documents in religious history. They proclaimed the coming unification of humanity and the emergence of a world civilization. The kings, emperors, and presidents of the nineteenth century were called upon to reconcile their differences, curtail their armaments, and devote their energies to the establishment of universal peace. Bahá’u’lláh passed away at Bahji, just north of Acre, and is buried there. His teachings had already begun to spread beyond the confines of the Middle East, and His Shrine is today the focal point of the world community which these teachings have brought into being.